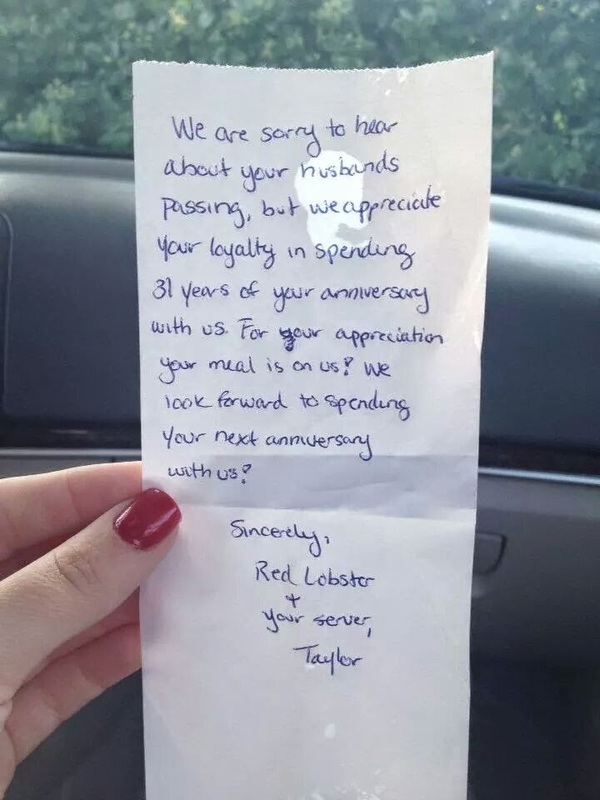 A branch of the popular American casual dining restaurant chain Red Lobster gave free meals to a mother and daughter when they learned that the two women were there to commemorate what would have been the anniversary of the mother and her husband. Unfortunately, the husband has passed away from cancer so it was her daughter who was with her that day. The woman and her husband had spent their anniversaries at the restaurant for the last 30 years. The restaurant wrote a hand-written note for the two women. The note said: "We are sorry to hear about your husband's passing, but we appreciate your loyalty in spending 31 years of your anniversary with us. For our appreciation, your meal is on us. We look forward to spending your next anniversary with us." The daughter took a photo of the hand-written note which was then shared by her brother on the social networking site Reddit.